In my area, there is no opening day; anglers can fish all year providing they renew their fishing license at the end of February each year. 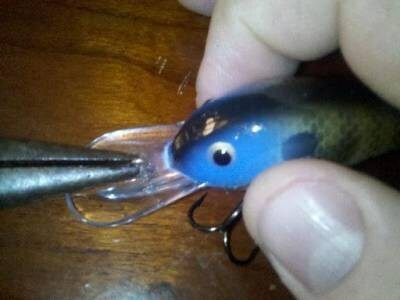 However many anglers hang up their rods and reels for the season once winter has set in. The recent task that WFN has given the ambassadors is an important topic. A prepared angler will be much safer, and will save time and money each spring when he is ready to hit the water.Preparation for the spring fishing season begins in the fall for the experienced angler. Proper maintaining your boat and preparation for winter storage will prevent costly repair bills and greatly speed up your spring prep, making opening day a pleasure instead of unexpected cost and last minute rushing to get things in order before you can fish. In the late fall, I strongly recommend cleaning your rods and reels before storing for the winter. Most creditable reel manufactures such as Shimano provide support or even on line step by step instructions for recommended user maintenance. If you are not sure web sites like say, WFN have some great post if you search the archives. And enough of the ?should of? and lest look ahead to the rest of the season. Whether you?re a tournament angler or a weekend warrior or an occasional fishing enthusiast, being prepaid will make your time on the water much more enjoyable for you and your friends and family. I will publish a quick checklist that you can print and use to be certain you have everything you need to enjoy opening day this spring.- - - - - - - - - - - - - - - - - - - - - - - - - - - - - - - - - - - - - - - - - - - - - - - - - - - - - - - - - - -Annual Fishing Preparation Check List:Fishing Equipment:* Fishing license* Updated fishing regulations for your state* Rods (flipping, cranking, jigging)* Reels (spinning and baitcasting)* Tackle box (Soft side w/ boxes)* Soft plastic assortment of baits* Fishing line (braided, mono and fluorocarbon). * Swivels and snaps (assorted sizes)* Sinkers (assorted sizes)* Hooks (assorted sizes)* Bobbers (assorted style and sizes)* Leaders* Glass and plastic beads and rattles* Lures (assorted top water, spinner baits, crankbaits)* Hook remover * Pliers (needle nose)* Pocket knife/multi tool* Hook Sharpener or file* Tape measure / Folding Ruler* Tournament Scale* Culling system*Dry Box (for cell phone and wallet)* Landing net* Map* Rain suit* Reel oil* Silicone spray* Extra rod guides and tips* Guide tape* Polarized sunglassesEmergency and First Aid Items* First aid kit (check expiration dates)* Insect repellent* Flashlight (fresh batteries)* Sunscreen *Weather Radio* Cell Phone chargerBoating Accessories* Paddles* Anchor* Rope* Tool Kit* Check Life jackets and/or vests* Check fire extinguisher* Registration* Fish finder / Depth finder* Cooler w/ ice, drinks* Packaged food and snacks- - - - - - - - - - - - - - - - - - - - - - - - - - - - - - - - - - - - - - - - - - - - - - - - - - - - - - - - - - -A couple more tips for after your trips: Rinse and dry lures when you get home to prevent hooks from rusting.Sharpen hook and repair lures before storing.Remove about two feet of line and re- tie lures and change line on your reels as needed.Remove batteries from flashlights and other electronic equipment to prevent corrosion from ruining the device. Remove unused food and trash.Follow regular maintenance instructions for your boat. 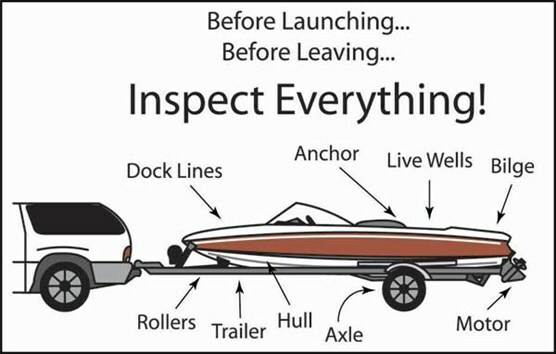 Follow invasive species sanitation for your boat, trailer and equipment.Being prepared is the best way to know that you are going to have a good day on the water.Happy Fishing!